Testing | ASET Services, Inc.
ASET offers both suitability testing and field testing of a variety of sports surfaces. Testing is offered for basketball and court surfaces (both wood and synthetic), as well as for indoor and outdoor running and walk/jog tracks. ASET conducts field testing on older existing facilities and performs performance validation or commissioning tests on a variety of newly installed surfaces. 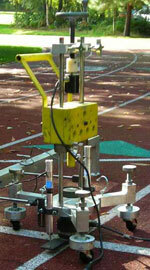 Suitability testing is a common practice for nearly all sports surfaces, wood, synthetic, indoor and outdoor. Suitability testing simply means that a representative sample was tested and found to produce suitable performance levels based on the requirements of the appropriate standard. Suitability testing results are traditionally used by manufacturers in their marketing, sales, and promotion activities. These results often find their way into project specifications. Visit our Suitability Testing Services page to learn more about ASET’s suitability testing, and about how ASET can help your product development process. ASET offers field testing services for the following surfaces: indoor/outdoor court (wood and synthetic), indoor/outdoor tracks (run/walk/jog), Playgrounds (tiles, poured-in-place, loose fill), and artificial turf. Field testing of indoor court surfaces is a relatively new concept in North America. It is common practice throughout much of Europe and within the North American artificial turf industry. Field testing can offer owners valuable information regarding the performance of their individual installation. Field testing is available for damaged and repaired sports surfaces. Field testing of older existing surfaces is often used to provide a performance benchmark for future replacement or expansion projects. To learn more about our field testing programs visit our Field Testing Services page to learn more about our field testing programs. ASET has added a page specific to field, or on-site, testing of playgrounds. You can access information specific to playground testing at our Field Testing – Playgrounds page to learn more about this specialized service. It is becoming more common for projects to consider commissioning of their newly installed sports surfaces. ‘Commissioning’ and ‘Performance Validation’ are terms referring to field testing of newly installed surfaces. This commissioning process helps to assure owners that the performance level promised prior to the sale was actually achieved at their installation. Commissioning can also be a valuable tool for architects and owners to help elevate the quality of contractors submitting sports surfacing bids to their project. Visit our Commission Testing page to learn more about our performance validation and commissioning programs, and how they can help ensure that your floor delivers the performance you expect.